I know very little about this whisky except that it is a single malt from Sweden and that it seems to divide opinion somewhat. Okay, the official website tells me that the “base” of this whisky is matured in first-fill bourbon casks stored, get this, 50 feet underground in a mine. The site also implies that Swedish oak is also used, so presumably this is not all from first-fill bourbon. No confirmation on whether the Swedish oak component is matured 50 feet above ground in a Swedish oak tree. Elsewhere on the site I learn that they also use Swedish peat and that the peat is “flavoured” with fresh juniper twigs. Everything but the bourbon casks appears to be local–down to the barley. Well, I now know infinitely more about Mackmyra than I did when I began to type this paragraph. Let’s see what this whisky is like. Nose: A little spirity at first but then turns quite floral with hints of spicy, perfumed wood. 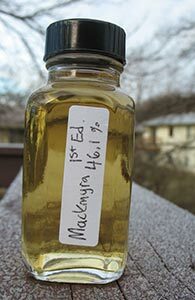 Smells young but smells quite nice–not intensely gingery like a lot of other young whiskies. Some lime after a minute or so and then a lot more fruit begins to show up: there’s some ripe pear and also a hint of melon and then some peach. Some toasted wood after a bit and a touch of vanilla/butterscotch too. The fruit gets quite intense after a few minutes and more tropical too: there’s some papaya now and maybe a hint of pineapple. I have to say I rather like this. What does the palate hold in store? With water the wood (polished now) is in nice balance with the fruit. Palate: Oh, quite nice here too. Leads with a spicy bite that takes a turn towards perfumed wood and citrus, by turns acidic and musky. More melon (unripe honeydew) on the second sip but also more of the wood. Does feel rather thin, even at 46.1% and there’s not a lot of depth of flavour in general. The wood does get louder with time and the water doesn’t do much to push it back, though it does draw out more fruit. Finish: Medium. Loses steam here. The spicy wood is the main player; still there are no off notes. Finish is a little longer with water but it’s not much better. Comments: A very pleasant surprise. I really liked the nose. The palate wasn’t quite at that level (the wood got a little too strong as it went along) and the finish further still but this is good stuff, and probably would be very good at cask strength. Odd, how low under the radar they fly (and I really don’t understand how anyone could dislike this, let alone want to pour it down the drain as I’ve read at least one person saying). Is their other stuff much worse? If not, come on, people, let’s give them some of the love Kavalan and Amrut get. And so reasonably priced too. I’m very excited to see where this spirit goes with longer aging (which the Swedish climate, at ground level or below, will certainly allow).